Home > Goodbye to Fossil Fuels > Seattle, Don’t Back Down! Everyone else has gone, But Shell Oil’s still hanging on. Every day they roll the dice, Melt away the Arctic ice. And now Shell Oil is at your door. They want to drill on the ocean floor. Seattle, Seattle don’t back down! Just do the math and you will learn We’ve got more than we can burn. You ought to know we can’t afford The Gulf of Mexico at our door. There’s just no reason to explore, Pour oil on the ocean floor. Seattle, Seattle don’t back down! Keep your port and keep your power. May this be your finest hour. Give your heart and take your feet, And take the street! This paradigm’s on borrowed time. It’s no time for being kind. For selling out this Paradise, Chopping down the Tree of Life. What’s it about? 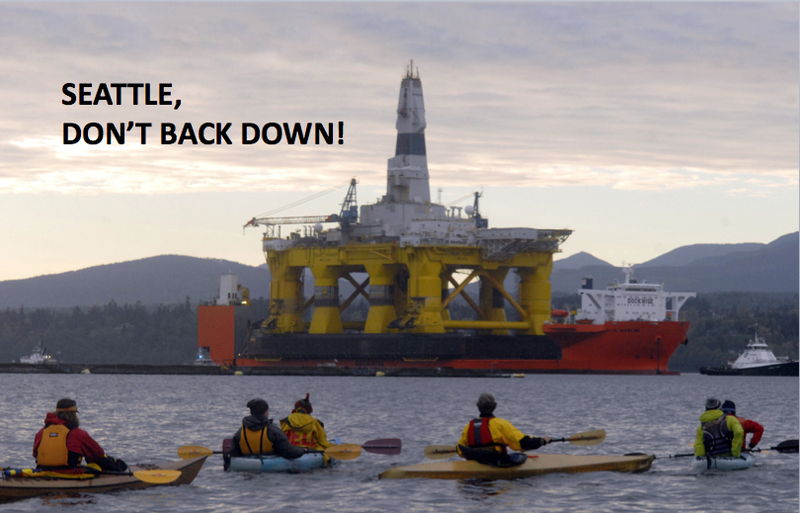 July, 2015: Shell Oil is the only remaining company that plans to drill for oil in the Arctic. They intend to use the Port of Seattle as a staging area for their Arctic fleet, including an enormous drilling rig, the “Polar Explorer”, now at anchor in Elliott Bay. Drilling in the Arctic is dangerous and irresponsible. The Arctic is a very fragile ecosystem. It is inaccessible due to ice for most of the year, though this has changed drastically in the past decade as a result of climate change. An oil spill in the Arctic has catastrophic consequences, and there is no backup nearby if needed. In addition, due to cold water temperatures, the Arctic lacks the microbes that can eventually break down oil in warmer waters. The Exxon Valdez accident in 1989 is a case in point: after more than 25 years, most of the spilled oil remains in the ecosystem, and numerous species in Prince William Sound have never recovered. The cost of this accident was about $3 billion to Exxon, but the harm done dwarfs this figure, and will never be paid for by those responsible. Even bigger than all these reasons is the fact of climate change. The world we once knew has already started to change, and so far we have only raised the average global temperature by 0.8°C (1.5°F). The scientific consensus worldwide is that if we can limit global warming to 2°C, we may yet avoid catastrophic climate change, with its attendant effects of crop failures, famine, sea level rise, species extinction, and probable military conflict around the world over food and water. Do the Math: So far, we are not on track for meeting this 2-degree limit. Calculations show that humanity has a collective “budget” of only 565 gigatons of carbon fuels left to burn, if we want to stop at 2 degrees. We already have 2,795 gigatons available. That’s five times more than we can burn. Why, then, keep looking for more? There is simply no justification for oil exploration in the Arctic. Fossil fuels are killing us all by extinguishing ecosystems and disrupting the steady, dependable global climate that humans have enjoyed throughout our history. The earth has provided us food and shelter for many thousands of years, but not for much longer, unless we act very quickly. The greatest irony is that we have the technical ability to go beyond fossil fuels right now, with today’s technology. Many people assert that changing to renewable energy is impossible, and that drilling for more gas and oil is essential for national security. Nothing could be further from the truth. If we survive the next few decades intact, it will be by seeing through these dangerous myths. Nothing is more important for national security than good food and water. And fossil fuel acquisition and combustion are endangering both by driving climate change and by directly poisoning water supplies with fracking activities. Seattle activists understand these things, and understand what an important moment is at hand. What Seattle needs is to be leading the way in carbon-free energy, efficient buildings and transportation. This great city of engineers can do better than be accessory to the demise of the Arctic and our global climate. SHELLNO.ORG A call to the Pacific Northwest to save the Arctic and the Climate.